I have a great group of guys with whom I get together every Friday morning. You may have seen us…well, not exactly us, but that group of retirees you see at the diner once a week. We talk, we laugh, we kvetch. That did it for me. I blew up. As soon as I was done, I regretted it. Friendship is sacred, and I was inappropriate to chastise my friends for not fully using their passion, creativity and commitment. For me, deciding who you want to be and what you want to do as you grow older is an ongoing, upward trajectory. How do you use your passion, creativity and commitment your entire life? We retire from work, but we don’t lose all that we’ve learned and contributed over the years of our careers. For me, my work at the Jewish Community Centers of Chicago and Camp Chi was never a job to me. I was always taking that famous camping phrase, “Always leave your campsite better than you found it,” and applying it to the world. In the end, I knew that I would back-off. My daughter-in-law, who is a psychiatrist, said “Dad they just want to reminisce, remember a time when they felt strong and virile.” But I see that they can still be powerful now. And, I suppose the other reason it’s hard to accept is because I hear them saying they are bored. 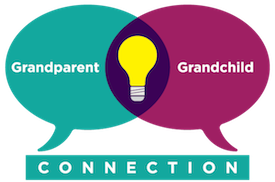 I know that my life is filled with passion and purpose because of my work to help grandparents and grandchildren enter each other’s worlds. For the guys, it’s as though they believe the greatest things they can do in the world have already happened. I say there’s more still to come. I deeply want them to look at their strengths, their skills, and their knowledge and to recognize that all of those things are still there. In the end, however, my frustration is with me. Their friendship means a great deal to me. I started this group 20 some years ago. Some have come and gone but there’s always a core group who gets together every week. It is me who needs to forego any arrogance and judgment and let them be them. So, the following Friday I apologized. They accepted. One even said I was right, although he didn’t plan to change his behavior. And we forewent telling the stories about losing our virginity. But I’m sure that’s what everyone was thinking about all week. Okay. Even me.